Is Hello Baby Studios for you? Do you love light-infused photographs with neutral colors and natural tones? Are you drawn towards candid connection over perfectly posed in portraits? Do you love photographs that feel natural with lots of emotion? Are you looking forward to enjoying your portraits in a relaxed and unhurried way, taking time to laugh and breathe and simply be with those you love most? Will you enjoy an experienced artist guiding you through the entire process - from organically styling your session to your final printed artwork that you can hold in your hands and cherish? Does the idea of sharing your photographs with your children in 20 years make your heart skip a beat? Is your favorite way to view a photograph in your hands instead of on a digital device? If so, Hello baby studios may be the perfect fit for you. We would love the opportunity to chat with you and share how awesome a session with Hello Baby Studios will be. We can connect via phone or in person at the studio to answer any questions you might have and create a vision for your session. If we're a good fit, we'll get you on the calendar and chat about all of the details of your session! Before your session, we’ll talk about your family and how you’d like to be photographed, and I’ll share what I can create for you. We’ll talk about wardrobe, expectations, and how you’d like to enjoy your artwork after it's created. The day of your session comes with such anticipation and we want you to enjoy it. Since we’ve already talked through all of the details, you’ll be completely prepared for your connection portraits. Most of my clients take advantage of our studio wardrobe, so all you need to do is arrive in your comfy clothes, and I’ll guide you through the entire process and create beautiful photographs that match the vision for our time together. This is the most exciting part of our time together! The art ordering appointment is the first time that you will see your artwork, and you will enjoy the experience of selecting from a collection of gorgeous first edition originals. 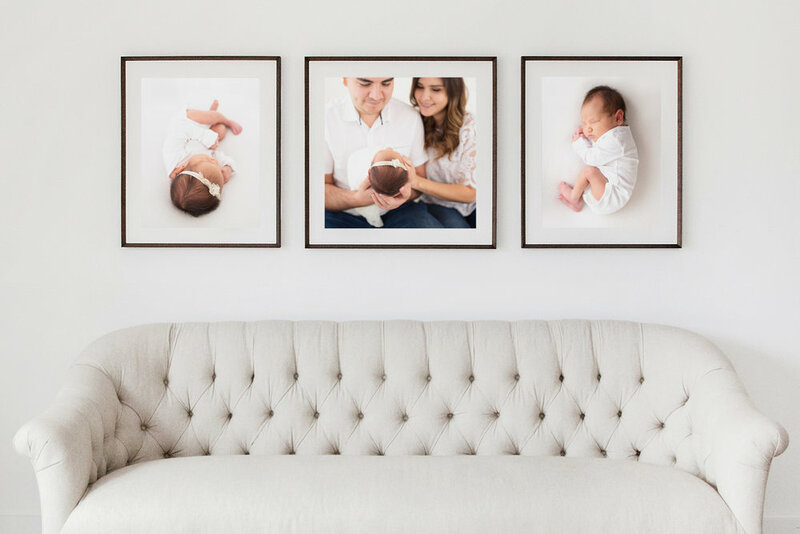 I’ll guide you through the entire process of selecting your favorites and the best presentation for each photograph, so you will be confident that your finished artwork will look its absolute best and be handcrafted to stand the test of time. Once your session is reserved, we set up a time for us to meet in person or over the phone for a Consultation. During this time we'll go over session details, discuss styling, and chat about how you would like to cherish your artwork. Styling plays such an important role in the overall look and feel of your portrait art. As part of your experience I offer a curated studio wardrobe for mama and baby and provide suggestions for dad and kids. Our Cozy Studio is located near Downtown McAllen and is designed to be a warm, relaxing place for our sessions with all the comforts of home. We have everything you’ll need to ensure you experience is relaxed and enjoyable. To find out more about our Studio visit here. 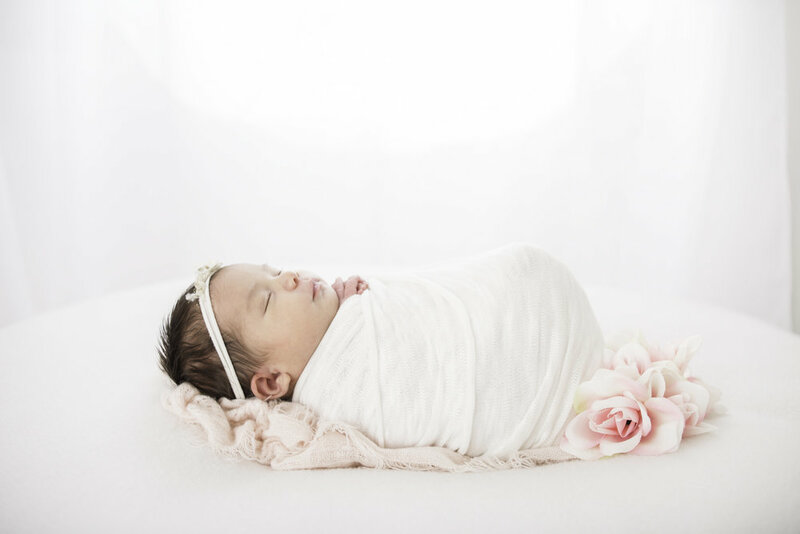 Our style is Natural, Organic and Timeless and we create artwork with soft light, neutral tones, and simple props that keeps all the focus on you and your little ones. Wooden toys, old-fashioned blocks, cuddly stuffed animals, and classic books are among some of the props you'll find in the Studio. My approach to posing both newborns and babies is simple, pure, and natural. It is always my goal to ensure both baby and their family have an enjoyable session. I prefer to keep baby loosely wrapped and cozy and don’t force poses on baby that they are not comfortable with. If baby allows I unwrap them at the end of their session and place them in a simple white onesie to capture them just as they are. I have worked with hundreds of babies over the years and am very attuned to their cues, likes and dislikes. It is always my hope that families leave my studio commenting on how relaxing and effortless their session was. After your session you are invited back to the Studio for a personal gallery reveal and art ordering appointment. There you'll watch a slideshow of your gallery and view your portraits for the very first time. This is also the time when we chat about which prints and products you would like to order. We offer a collection of curated Prints, Albums and Frames that you can cherish now and with future generations.